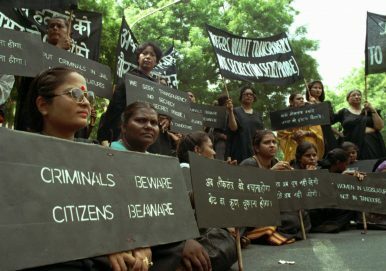 Women from various social organizations stage a silent and non-violent sit-in protest against the criminalization of politics near Parliament House in New Delhi (July 31, 1995). Why are so many people facing criminal charges still elected to India’s legislative bodies? Crime and politics in India are so intertwined that a “clean politician” sounds like an oxymoron, a breed that no longer exists. This fact hits home even harder as the world’s largest democracy, and, with 1.3 billion people, the second most populous nation after China, gears up for a high-octane election in 2019 to determine the fate of the ruling Narendra Modi government. Democracy is thriving in India, with 554 million voters queuing up at over 900,000 stations to cast their ballots in 2014 to determine the fortunes of 8,250 candidates representing 464 political parties. But all is not well with the country’s polity. Corruption is striking at the very root of the democratic ethos, with nationwide surveys highlighting the extent of the rot. According to a report released this April by the Association for Democratic Reforms (ADR), a nonprofit that works on electoral and political reform, a total of 1,580 Members of Parliament (MPs) and Member of Legislative Assemblies (MLAs), or approximately 33 percent of the legislators in India’s Parliament and state assemblies, have criminal cases pending against them. While some of their charges are minor, over 20 percent of the new MPs face serious charges such as attempted murder, assaulting public officials, and theft. Almost all parties in India, led by the ruling Bharatiya Janata Party (BJP) and the main opposition Congress, field tainted candidates, the report states. The analysis was based on affidavits submitted by legislators. Out of a total of 4,896 MPs and MLAs in the country, the study analyzed affidavits of 4,845 of them, including 768 of 776 affidavits of MPs, and 4,077 of 4,120 MLAs. The crime-politician nexus has invited opprobrium from no less than the country’s highest court. In September, the Supreme Court ordered the Parliament to “cure the malignancy” of criminalization of politics by making a law to ensure that persons facing serious criminal cases do not enter the political arena. It also advised that the “polluted stream of politics” be cleansed. Holding that the criminalization of politics is an “extremely disastrous and lamentable situation,” the five-judge constitution bench headed by erstwhile Chief Justice Dipak Misra said this “unsettlingly increasing trend” has the propensity to “send shivers down the spine of a constitutional democracy.” The court added that the criminalization of politics was “not incurable” but the issue was required to be dealt with soon before it becomes “fatal” to democracy. “Our Indian democracy has seen a steady increase in the level of criminalization creeping into Indian polity. This tends to disrupt constitutional ethos, strikes at the root of democratic form of government, and makes citizens suffer,” the judges added. Experts opine that a major reason why corruption is so entrenched in the system is because there is no stringent law that requires political parties to revoke the membership of tainted candidates. A column by Soutik Biswas for the BBC points out that criminals get elected not only because many voters are ill-informed, but also for sociopolitical reasons. “[V]oters support criminal candidates in constituencies where social divisions driven by caste and/or religion are sharp and the government is failing to carry out its functions — delivering services, dispensing justice, or providing security — in an impartial manner,” writes Biswas. In 2014, ADR, along with National Election Watch, a campaign comprising 1,200 nongovernmental organizations working on electoral reforms, analyzed the self-sworn affidavits of 542 of 543 winners in the 2014 Lok Sabha elections and found that a candidate with a criminal background was almost twice as likely to win than a candidate with no criminal background. The winning chances of a tainted candidate were 13 percent, while those of a clean candidate were 5 percent. In fact, so rampant is corruption among politicians in the hinterland, bedevilled by entrenched social and gender inequities, that sullied candidates often wear their disrepute as a badge of honor. Boastful claims among candidates about who is the “biggest criminal” are common. In a classic case of life imitating art, Bollywood, the Indian film industry, often portrays Robin Hood-esque criminal politicians as protagonists. Many such movies have gone on to become hits. Another reason why criminality thrives in the political arena, say analysts, is because of prolonged trials in court and lower conviction rates. According to IndiaSpend, a data-driven journalism website, in September this year only six percent of criminal cases against India’s MPs and MLAs ended in conviction, according to data submitted by the central government to the Supreme Court. Of 3,884 such cases – conviction for which results in a six-year ban from contesting elections – guilty judgements were pronounced in 38 incidences and 560 were acquitted. In 18 of 29 states and two of seven union territories, there were no convictions for criminal cases against MPs and MLAs; the cases include murder, attempted murder, kidnapping, hate speech, and criminal intimidation. The spiraling cost of elections and an opaque election financing system characterized by parties and candidates under-reporting collections and expenses inevitably leads to parties preferring cash-lush candidates “who do not represent a drain on the finite party coffers but instead contribute ‘rents’ to the party,” Vaishnav explains. Many of these candidates are on the wrong side of law. Indeed, there has been no serious attempt to cleanse the system as a flawed one suits all. In March 2014, the Delhi High Court indicted the ruling BJP and the Indian National Congress for receiving foreign funds in violation of the Foreign Contributions Regulation Act (FCRA). It directed the government and the Election Commission to re-examine these violations. However, the government amended the FCRA with retrospective effect and passed a money bill without any discussion in Parliament. This has set a dangerous precedent. The move has institutionalized unlimited anonymous funding to political parties that can’t be questioned or accessed under the Right to Information Act of 2005. As experts point out, to tackle the root of the problem, India needs a cohesive approach to make its election financing system transparent, urge parties to become more democratic, and ensure that people have access to better services and an equitable justice delivery system. “It is imperative that the Parliament evolve a mechanism to keep criminal politicians out of the political fray and the people continue their struggle for the decriminalization of politics at every level of government. Else soon, India’s claim to be the world’s largest democracy will ring hollow,” says Jhaveri.